If you’re ready to make a major change to your kitchen but not quite ready for a full renovation, we have 5 ideas for improvements that won’t require a full remodel. Some of the ideas are DIY, others may require some outside help, but the changes will be dramatic and (bonus!) will increase the value of your home. Roll up your sleeves and let’s get started. Painting: One of the most satisfying (and affordable) refreshes you can make is to repaint your kitchen. We’re not just talking about the walls. Painting your cabinets is a great way to overhaul outdated wood cabinets. Consider freshening things up with white or light gray. Also, painting your kitchen island with a dramatic accent color can make it instantly current. Lighting: New lighting fixtures is great way to add instant style. Kitchen lighting fashion has evolved over the past 10 years. Suddenly, an out of date kitchen gets an injection of cool with statement island pendants or an over the sink focal area. Hardware: Replacing your kitchen hardware (knobs, pulls, handles) is a simple, inexpensive way to update your cabinetry. Mark and I recently replaced our decade-old, rounded knobs and handles for a more stream-lined style with a brushed nickel finish. Instant satisfaction. Just make sure the new hardware lines up with the current holes in your cabinets unless you plan to fill and paint. 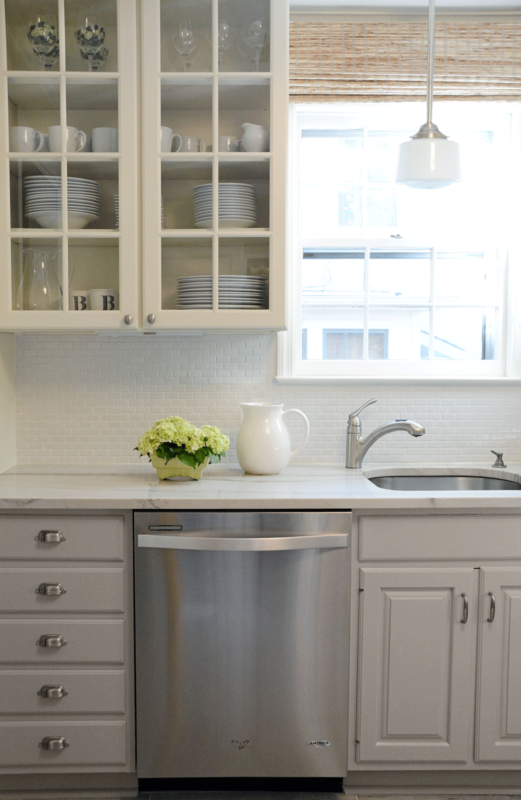 Appliances: Replacing outdated appliances with stainless steel will make a huge difference. Plus, most new appliances are certified to use less energy. Counters: If you have laminate counters consider updating to stylish and durable granite or quartz. This is often recommended for increasing the resale value of your home. Let us know if you need any resources to help you get started. And if you need help getting your kitchen ideas flowing, contact us to schedule a consult!